You’ve only got to stroll down Hardin Street to the main drag, then hang a left and walk a couple more short blocks, to see what Fort McMurray is about. It wouldn’t be the whole story, but you would catch the drift. You’d pass the Boomtown Casino, strip malls, and a club called Cowboys proudly advertising “naughty schoolgirl nights”. Then the Royal Canadian Mounted Police station, the municipal offices, the Oil Sands Hotel, and Diggers bar, with its advertisement for exotic dancers. You would be passed by Humvees and countless pick-up trucks, each more souped up than the next, many covered in dried mud, many carrying further 4x4s – in winter, snowmobiles; in summer, all-terrain vehicles on which to go chasing through the bush, which is visible from the main street. And if the wind is from the north-west, you can smell oil on the air: heavy, slightly sour, unmistakable. Round here, they call it the smell of money. As the Middle East has become more unstable, as Iraq has boiled into chaos, other, more unexpected places have flourished, and none more so than Fort McMurray. Five hours’ drive north of Edmonton, in Alberta, it has always been a frontier town, and even before the first white explorers came fur-trapping, the Indians knew that this place sat on oil – they used it to waterproof their canoes. The trouble has always been that it’s not conventional crude, easily liberated from the earth, but tar sands (also known as oil sands) – a mixture of sand, water and heavy crude which is much more difficult and expensive to extract. It can cost about Can$26 ($US27; £13) a barrel to do so – so when that was comparable to the price of oil, there was no point in trying; now that oil is close to breaking the $100-a-barrel barrier, there definitely is. 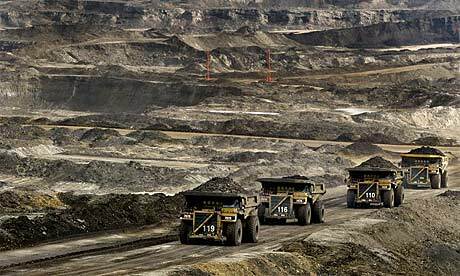 For years there were only two outfits mining the Athabasca oil sands, which occupies 141,000 square kilometres; now there are seven, including Shell, whose first plant became operational in 2003, the year the Iraq war started (the remaining four have not yet started production). Eventually, Shell alone intends to extract 500,000 barrels a day, and to do so for 50 years; in total 1.2 m barrels are extracted each day, a number projected to rise, when all the plants are operational, to 3.5m. The companies intend to invest $100bn in the area in the next 15 years; if oil prices stay as they are, or rise, and once the capital costs are paid off, they’re playing for possible profits of tens of billions a year – much of which will come from America, gleeful at this sudden access to so much “safe” oil right next door. Current technology means companies can reach only about 10% of deposits, but even that makes the Athabasca oil sands the second largest proven oil reserve in the world. Add in the so far unreachable 90%, and Alberta’s oil reserves would be at least six times the size of Saudi Arabia’s. Already Canada produces as much oil as Kuwait. Soon it’ll be two Kuwaits. Canada is the biggest single supplier of crude oil to the US. Small wonder Canada is increasingly described as the world’s next great energy superpower. Ask anyone why they’re in Fort McMurray and – apart from the occasional person who says they were born here – the answer is the same. A quick rub of forefingers and thumb, a knowing look. Or, in the case of irrepressible 11-year-old Ron Mfoafo-M’Carthy, here with his sister and mother to visit his father, a Ghanaian engineer: “Cha-ching!” Projects are going up so fast that there is a huge shortage of skilled labour, and the companies are paying way over the odds to get it. An engineer like Johnny Mfoafo-M’Carthy can make, including living allowances, up to Can $220,000 (£110,000) a year here, compared with $90,000 in Toronto; you only need a high-school education and a six-month certificate to qualify for a $100,000-a-year job driving heavy equipment. One cocky 26-year-old I meet claims he sometimes earns $1,000 a day driving a truck. He already owns two homes and two flash vehicles (or, as he puts it gloatingly, “nice rims”). School leavers share tales on internet message boards about being able to walk out of one job in Fort McMurray and, 10 minutes later, walk into another one. This is perhaps an exaggeration, but it explains why, every day, people come from across Canada, from across the world, to a town whose weather can be, even by Canadian standards, brutal: in winter temperatures hover below -40C, not counting windchill, for weeks. Most Canadian towns at this latitude, this far from the nearest metropolis, are white, sprinkled with the occasional aboriginal face; Fort McMurray’s population – average age 31, average family income $135,000 (the highest in Canada; the national average is $67,600) – includes representatives from more than 70 different nations, from Fijians to Mauritanians, Venezuelans to refugees from the wild Somali-Ethiopian borderlands. In my first 24 hours in Fort McMurray, every conversation I overhear involves cash. Hourly rates; possible hourly rates; hourly rates the other guy is getting. People talk ostentatiously about how much overtime they do because it means they’re coining it, and that’s what counts in terms of status. In the lift at my hotel, a Thai woman asks me, unsolicited: “So, you here to visit your husband, or to look for work?” – there being, it seems, no other categories to fit into. It is possible to have a very good life in Fort McMurray. You can treble your salary, buy two homes, dig a swimming pool, pay off your mortgages 20 years earlier than anyone else and retire. You can go skiing, fishing, hunting and trapping in the vast outdoors you can see from any one of the sprawling new suburbs going up as fast as contractors can build them. You can play hockey at midnight, if that’s when your shifts end; your children can join baseball, football or ringette (similar to hockey) leagues. Just as the California gold rush came to define the American dream, so Fort McMurray defines a particular kind of Canadian dream. Go west. Fort McMurray can change your life. But first, perhaps, consider what price you are willing to pay. Apart from the smell, you get little sense of what the oil sands are like unless you drive 45 minutes up Highway 63 and take a site tour of, say, Syncrude, a consortium that includes Imperial Oil and Petro-Canada. You might know that it’s the world’s largest producer of synthetic crude, but it still takes a while to comprehend the awesome size of its operations here. After the boreal forest is cleared and the peat bog removed, what’s left is dark, molasses-like, oil-saturated sand, which is then transported by trucks with tyres as high as two-storey houses. When full, they weigh more than two Boeing 747s; they can crush a pick-up truck without noticing it. Mining this way is hard, boring, ugly work. A heavy-hauler can do up to 63 trips a day, trundling past mountains of pure yellow sulphur (a byproduct of oil purification once it has been extracted from the sand) 80 feet high. In winter there can be so much steam that bulldozer drivers have to inch around, hoping not to topple into tarry pits; in summer there’s so much dust it has to be sprayed down. Workers get three 20-minute coffee-breaks in a 12-hour shift, which can, as in the case of Shell’s Albian Sands, be bookended by two 90-minute commutes from Fort McMurray. Workers arrive in flotillas of buses and sometimes, in the case of the heavy-haulers, that can be the only time they see anyone else all day. The extraction of the oil requires heat, and thus the burning of vast amounts of natural gas – effectively one barrel of gas to extract two of crude – and some estimate that Fort McMurray and the Athabasca oil sands will soon be Canada’s biggest contributor to global warming; nearly as much as the whole of Denmark. This in an area that has already seen, according to David Schindler, professor of ecology at the University of Alberta, two degrees of warming in the past 40 years. The oil sands excavations are changing the surface of the planet. The black mines can now be seen from space. In 10 years, estimates Schindler, they are “going to look like one huge open pit” the size of Florida. Acid rain is already killing trees and damaging foliage. The oil companies counter that they are replanting – grass for bison, 4.5m trees by Syncrude alone – but the muskeg (1,000-year-old peat bog and wooded fen, which traps snow melt and prevents flash floods, and is home to endangered woodland caribou) is irreplaceable. Two barrels of water are required to extract one barrel of oil; every day as much water is taken from the Athabasca river as would serve a city of a million people. Although the water is extensively recycled, it cannot be returned to the rivers, so it ends up in man-made “tailings ponds” (tailings is a catch-all term for the byproducts of mining), which are also visible from space. According to the US Department of the Interior, the dam holding back Syncrude’s pond is the largest, by volume of construction material, in the world. Four of the projects haven’t started production yet, so their tailings ponds haven’t begun, but theirs, too, will soon be full of sand and what Schindler calls “dead water” because, he says, they’re full of carcinogenic hydrocarbons and toxic trace metals such as mercury, cadmium and arsenic, all topped off, in Syncrude’s case, with an oil slick. The companies are aware than none of this looks good and come out fighting. When I ask Shell if I can speak to its senior vice-president, oil sands, it provides Rob Seeley, the general manager of sustainable development, instead. He explains Shell’s commitment to reduce emissions by 50% by 2010 – though compared with conventional imported crude, that would only reduce overall emissions by 15%. Politically, the oil companies have it all their own way. Alberta has always been more rightwing than the rest of Canada. The free market, oil revenues and the province’s direct relationship to America – it has its own representative in Washington – trump all other considerations. Provincial government strategy has been to allow the companies to regulate themselves, overseen by “multi-stakeholder committees”. Environmental and aboriginal groups are outnumbered and all decisions must be consensual, which militates against the making of environmentally useful decisions. The federal government, led by a conservative Albertan, talks tough, but quietly approves more and more projects, even though the oil sands would have to be shut down altogether if Canada was to have a hope of meeting its commitment to the Kyoto agreement on reduction of emissions aggravating climate change. Everyone, as Canadian author William Marsden argues in a book unambiguously titled Stupid to the Last Drop: How Alberta is Bringing Environmental Armageddon to Canada (and Doesn’t Seem to Care), is turning a blind eye. Mayor Melissa Blake, just back from honeymoon, has the unenviable job of running a town buckling under the demands of a population that has doubled in the past 10 years, from 32,000 to about 65,000 – not counting a shadow population of about 10,000 itinerant construction workers. It is projected to grow by another 40,000 in the next five years. Increasingly, she has been squaring up to the Alberta government and to the oil companies: with one, for more money (funds are allocated on the basis of the stable population, not the shadow population, who pay taxes elsewhere); with the others, to slow, even halt construction of the mining and processing sites until she can catch up. No one seems much inclined to listen, so she is firefighting madly. A new sewage treatment plant, begun before a credit agreement was even in place, will be finished in 2009 – and will be too small a year later. A school that took three years to build was too small a year before it opened. Medical services are almost overwhelmed. Blake estimates that she needs roughly $2bn; this year she has debts of $330m. McMurrayites are also obsessed with housing. Prices have gone up by 40-50% in the past couple of years, and an unprepossessing three-bedroom bungalow now costs $600,000. Rents are among the highest in Canada – expensive cities such as Toronto or Vancouver notwithstanding – if there’s anything available at all. Converted garages or spare rooms (no kitchen, no separate bathroom) can cost more than $1,000 a month. Before she came to Fort McMurray looking for a better future for her three children, Inderjit Kaur, 40, taught computers and English in Mohali, in the Punjab. She began by nannying for her sister in exchange for minimum wage and board, and now has two jobs, nannying and taking telephone bookings at the big new recreation centre. She works 7.30am to 10.30pm, with few days off. After tax she earns $2,000 a month; a two-bedroom flat would cost $2,500 a month, so she can’t ask her family to join her. She told them it would take a year, but she hasn’t seen them for four. There is a severe shortage of low-income housing in Fort McMurray, and since Kaur is effectively single, she keeps being bumped down the list in favour of families. “Have you been to the bushes?” she demands. In a place where earning $70,000 a year means you’re effectively working poor, it is not uncommon for even the employed to resort to living in tents. The city enforces bylaws and moves them on, but people just set up their tents elsewhere. At the Communications, Energy and Paperworkers Union office downtown, they get up to 10 people dropping by every day asking for work. “People walk in here broke and think money’s going to fall off the trees or something,” says union vice-president Tod Jackson. They’d rather people called before they boarded a Greyhound bus, because the message would be stark: don’t come unless you have lined up work and accommodation; don’t come unless you have savings; don’t come unless you have a skill. Just down Franklin, at the Centre of Hope, Trina Rolsdon, 44, is having a smoke and cutting her nails. She lived with her partner and son and worked as a waitress until degenerative arthritis, the breakdown of her relationship and the lack of affordable housing put her on the streets last year. Originally from a tiny town in southern Alberta, she is probably one of the people of whom Tonia Enger, the officer in charge of Fort McMurray’s Mountie detachment, would ask, “Why are you still here? Maybe you should go home.” Rolsdon has no love for the place, but she is hanging on until her 16-year-old son graduates from school. Then she will gladly leave. Fort McMurray may be full of opportunity, of quietly prosperous people, but “I think it can be very intimidating for somebody new coming in,” says Angela Adams, a heavy equipment operator and union grievance officer. “It can be hard to find support systems.” It’s even worse if you’re from, say, the South Sea Islands, or Bosnia, and you don’t speak English. “The problem of isolation is huge,” says McKeogh, who points immigrants to language classes for skilled workers, and helps find translators for driving licences and contracts. “There’s a high incidence of depression.” Adams makes confidential appointments for employees with mental health issues. Half the time, she says, hospital short-staffing means there is no one equipped to deal with them. Suicides may not often be reported, “but you hear about them through the grapevine”. Out in some of the camps, far from the town, another worrying story seems to be unfolding. Canada has a “temporary worker” immigration scheme, whereby people can work for two years, but must then return to their home countries. The oil companies have seized on this as a solution to their labour problems, bringing contingents from the Philippines, China, Mexico, flying them – according to rumour – in chartered 737s directly to site airstrips, bussing them into town maybe once a month to shop, then flying them home again. That story, so far, is largely hidden. Far more obvious is the social impact of a single-industry economy experiencing exponential growth. Sudden windfalls of cash, especially for those used to straitened circumstances, can be a mixed blessing. Men coming off a long run of shifts can easily spend $800 in a night; some have been known to lose $20,000-$30,000 at the Boomtown Casino. Frugal living can set you up for life, but there are many who earn $100,000 and still find themselves living from pay cheque to pay cheque. Dave Beaton, 56, has a simple diagnosis for what happened to him: “Too much money.” He raised two children by himself in Vancouver, then, when they got jobs of their own, came to Fort McMurray, got a $35-an-hour job as an instrument mechanic, discovered hard drugs for the first time, and is now homeless. “I felt I deserved a little holiday. It hasn’t stopped.” It’s difficult – a five-minute walk down Franklin Street, he claims, can net a dealer hundreds – but he’s trying to get clean, because “my kids are mad at me”, and because he misses them. Blue eyes, framed by wiry grey hair and a baseball cap, water. He sniffs and bows his head. The town is up in arms about a recent article in the Canadian magazine Chatelaine, which noted that escorts make more here than anywhere in Canada, and described a dating atmosphere of rampant mistrust and betrayal. You can see why people are insulted, but it’s not hard to understand how the piece came to be: there are 11 pages of escorts in the Yellow Pages (annotated, in my hotel room), and the subject often comes up with little prodding. Men complain that women just want them for their money, but, as one woman said tartly, if they will go out at night wearing a Syncrude badge (guaranteed $100,000 a year), what do they expect? In their defence, it’s a way of standing out from the crowd; it probably also provides a kind of armour, though not against gold-digging. There’s a lot of bravado here. You see it in the different degrees of swagger, in briefly unguarded eyes. At Bailey’s bar I watch a thick-set man in his 50s, with a neat white beard, pause in the doorway. He looks round the room, breathes in deeply, deliberately forces his shoulders back and down. Then he straightens the badge on his chest, and walks to the bar. Wayne Bonham, 39, is getting out altogether, going back to Ontario. He has done well, running a fleet of hire cars, but has come to the conclusion that he will never meet a girl here. Even if he did, this is not a place in which he’d want to raise a family. The departure lounge at Fort McMurray airport is full of badly fitting jeans, stale-alcohol breath, sandy moustaches and physiques earned by long hours on site: paunches, tired eyes. The few women – one in 3in heels and riding-up-tight skirt, another with three children, a third with bags of bridal gear – have obviously just said goodbye to their men again. A craggy, tanned French-Canadian murmurs into his mobile phone: “Je t’aime.” Ground crew smile indulgently at the young Newfoundlander just off the night shift who has to be nudged awake for his flight. When the plane takes off, it feels as though everyone is going home. · This article was amended on Thursday November 1 2007. The author of Stupid to the Last Drop: How Alberta Is Bringing Environmental Armageddon to Canada (And Doesn’t Seem to Care) is William Marsden, not Peter, as we said in the above article. This has been corrected. This entry was posted on January 13, 2008 at 9:06 pm	and is filed under Uncategorized. Tagged: alberta, boreal forest, global warming, oil sands, stelmach, tar sands. You can follow any responses to this entry through the RSS 2.0 feed. You can leave a response, or trackback from your own site.